First of all, “surrendered” is not a term defined in either the Internal Revenue Code (IRC) or the Immigration and Nationality Act (INA). It is a casual term to describe people who gave up their U.S. citizenship regardless of the method used. This term describes people who performed an “expatriating act” with the intention to relinquish U.S. citizenship. Common expatriating acts include acquiring another country’s citizenship. Or being a state worker for another country, joining the army of another country etc. You can find the list in Section 349 of the INA. 7. conviction for an act of treason against the Government of the United States or for attempting to force to overthrow the Government of the United States (Sec. 349 (a) (7) INA). Above all, no formal notification needs to take place for the U.S. citizenship to be lost (for immigration purposes). One would simply perform such an act with the intention to relinquish U.S. citizenship. He/she could rightly claim to no longer be a U.S. citizen after performing that act. However, for tax purposes, it’s not an easy process as it seems. For example, if the expatriating act occurred after 2004, one would continue to be taxed as a U.S. citizen. He/she should notify the Department of State and then files form 8854 with the IRS. Practically speaking, that notification takes the form of going to a U.S. consulate, convincing them that the expatriating act occurred and applying for a Certificate of Loss of Nationality. The fee for this procedure is $2,350. Unlike the relinquishment, the loss of citizenship would occur right there and then. As soon as the U.S. citizen tells the consulate employee “I’m out of here”. Also, the U.S. citizen wouldn’t need to convince the consulate officer that an expatriating act occurred since the expatriating act would occur during the appointment at the consulate. As for a relinquishment, one would need to file form 8854 in order to no longer be a U.S. taxpayer. If the taxpayer had children who were born after the expatriating act and wants to keep the children out of the U.S. tax system. If the parent was not a U.S. citizen. 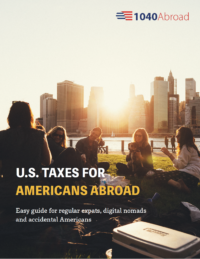 Either way, you want to document your separation with the United States with a Certificate of Loss of Nationality, file form 8854 and honestly certify that you were tax compliant for the prior 5 years. You want a “clean break”. Would you like to book a free 20-minute consultation call with U.S.citizenship and tax expert? Book your spot here and have your questions answered by a team of 1040 Abroad. The blog post was originally posted in 2017. It was updated on September 12th, 2018.
you can either ask question here or reach us out by dropping email at owagner@1040abroad.com. Actually, renouncing is just one way of relinquishing U.S. citizenship. Renunciation is the form of relinquishment that takes place in the presence of the U.S. State Department (Consulate or Embassy). Only those who “renounce” are subject to provisions of the Reed Amendment (which has only applied a couple of times anyway). The Reed Amendment is the part of the Immigration and Nationality Act that mandates that those who renounce U.S. citizenship to avoid U.S. taxation become excludable aliens. Please note that (at least at present) the Reed Amendment is not being applied to those who renounce. But, it does exist in the statute. Therefore, all other things being equal (which they rarely are), a form of relinquishment other than renunciation is preferred.